Being a first time home buyer can be a daunting process, especially since many steps to the home buying process are “behind-the-scenes.” You may ask, where do I begin? Have no fear - in this article we break down the mortgage process and provide helpful hints to guide you along the way. Before you begin the search for a new home, you must pre-qualify for your loan. This step can throw off a first-time home buyer. Pre-qualifying for a loan is often confused with pre-approval. Pre-qualifying helps you learn how much of a mortgage you will be able to afford, which helps narrow down your options. 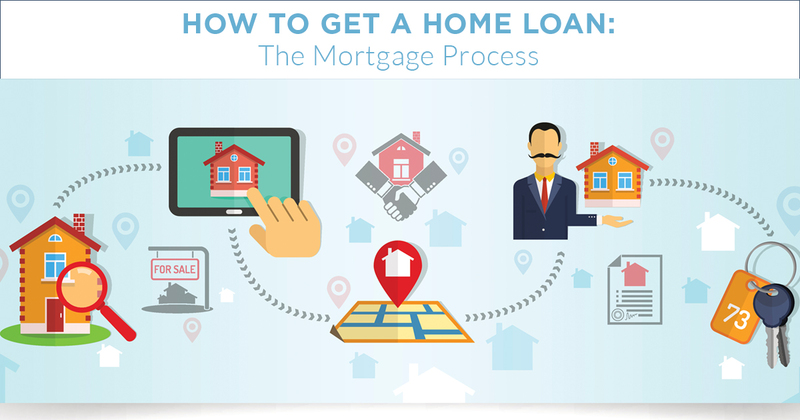 This step in the mortgage process is relatively quick. Your income, credit and assets are evaluated. A handy tip for pre-qualification: Be open and honest about information. Failure to provide accurate numbers could damage your credibility with lenders and affect your ability to get a mortgage. Fully disclose anything the lender may need to know. Following the pre-qualification step, homebuyers should seek pre-approval. In this stage, you will complete an official mortgage application and give the lender documentation that allows them to perform a background check on your credit and finances. Once the background check has been completed, the lender will be able to tell you the specific mortgage amount that you have been approved for. Benefits of this stage: Being pre-approved for a mortgage can help the home buying process move faster. Also, you will know how much you can afford, helping you narrow down your search for a home. Once you’re pre-approved for a mortgage, you can begin your search! With your knowledge of how much you can afford, you can search for houses that are within your budget. A tip for your home search: Try to stay within your budget! Falling in love with a home that you can’t afford can ruin your search. Once you feel you have found the right home, your agent will help you write an offer. After submitting your offer to the seller, they will either negotiate, accept or reject your offer. Make sure you make your best offer your first offer. You can’t assume that the seller is going to make a counteroffer to make you pay more money. Something to note when you make an offer: Don’t make an offer that is higher than what the property is appraised for. Your cap offer should be the maximum appraisal price to ensure your bank will provide the loan amount. If you have made it to this step, your offer on a home has been accepted! This means you will now lock in the interest rate for your loan. What does this mean for you? If interest rates increase, yours will not. It will remain at the rate at which it was locked. Your credit history. Underwriters check your credit scores with all three of the major credit bureaus (Equifax, Experian and TransUnion). If there is any red flag found in your credit history, you will have to provide a letter of explanation. This letter will include valid reasons for why you made mistakes in the past and how you are working towards correcting them. Appraisal. The underwriter will then review the appraisal of your potential home to make sure the value of the home matches the amount of money you are asking for in your loan. Perceived risk. An underwriter will investigate how much of a risk you could be. Your employer could be contacted to verify that you do in fact work for that company, and the salary you listed on your loan application matches what you make. If there are questions, the underwriter may ask for additional information. A quick tip on how to make sure you get past the underwriter: Always respond to the underwriter promptly and provide him or her with the complete information they need. You have finally made it to the end of the mortgage process: the closing. At this stage of the process, all of the appropriate documents will be ready for you to sign on the dotted line. At the closing, it’s important to make sure that you have brought all the necessary funds for closing costs. Once you sign, you can leave with the keys to your new home! A tip for a smooth closing: To make sure you know what you’re signing, see if you are able to get some of the documents ahead of time for you to review. By doing this, you can lighten your load of all the documents you have to review on the day of signing. If you have questions about some of the documents, you have them ready at the closing. The last, and maybe most exciting “step” of the mortgage process, is moving into your new home! The home buying process can be complicated, but the good news is Space Simply can help! We will work with your lender to secure the correct paperwork and assist you with all closing processes. Get started with Space Simply by connecting with online or calling us at (515) 423-0899.